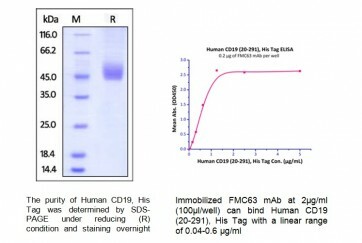 Human CellExp™ CD19, Human recombinant | 9246 | BioVision, Inc. This protein is fused with a 6× His tag at N-terminus and has a calculated MW of 31.6 kDa. 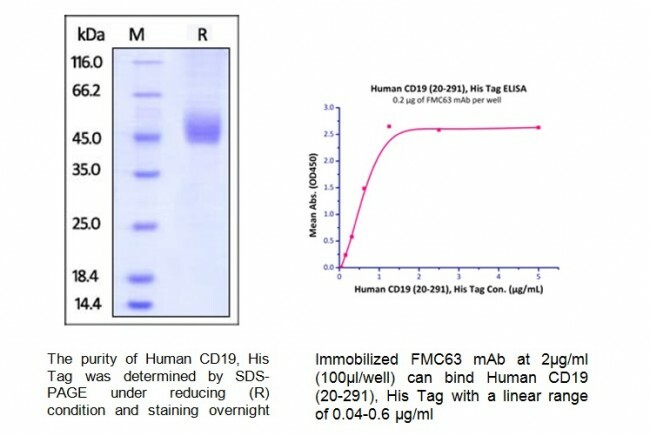 Immobilized FMC63 mAb at 2μg/mL(100μL/well) can bind Human CD19 (20-291), His Tag with a linear range of 0.04-0.6 μg/mL. Centrifuge the vial prior to opening. B-lymphocyte antigen CD19 is also known as CD19 (Cluster of Differentiation 19), is a single-pass type I membrane protein which contains two Ig-like C2-type (immunoglobulin-like) domains. CD19 is expressed on follicular dendritic cells and B cells. In fact, it is present on B cells from earliest recognizable B-lineage cells during development to B-cell blasts but is lost on maturation to plasma cells. It primarily acts as a B cell co-receptor in conjunction with CD21 and CD81. Upon activation, the cytoplasmic tail of CD19 becomes phosphorylated, which leads to binding by Src-family kinases and recruitment of PI-3 kinase. As on T cells, several surface molecules form the antigen receptor and form a complex on B lymphocytes. The (almost) B cell-specific CD19 phosphoglycoprotein is one of these molecules. 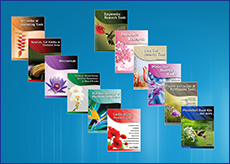 The others are CD21 and CD81. These surface immunoglobulin (sIg)-associated molecules facilitate signal transduction. On living B cells, anti-immunoglobulin antibody mimicking exogenous antigen causes CD19 to bind to sIg and internalize with it. The reverse process has not been demonstrated, suggesting that formation of this receptor complex is antigen-induced. This molecular association has been confirmed by chemical studies. Mutations in CD19 are associated with severe immunodeficiency syndromes characterized by diminished antibody production. CD19 has been shown to interact with: CD81, CD82, Complement receptor 2, and VAV2.